Did you ever wonder why you cannot loot crates in Skyrim? This mod now makes it possible. This mod was ported from my original Skyrim version here. How is this mod different from the original Skyrim version? 1. I have rewritten the mod from the ground up to convert all vanilla crates to containers, including all DLC world spaces and cells. 2. No wild edits, ITMs, or deleted refs. 4. I removed level list changes on furniture. There are many other mods that do that. This mod attempts to keep the vanilla feel as much as possible by not making items too over powered. The mod also attempts to add items to containers that make sense. 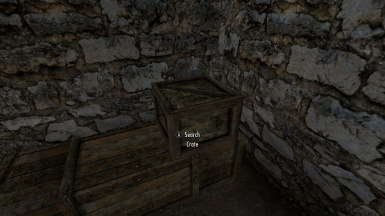 For example, the smaller crates should not include large items such as hammers, etc. The large crates have a chance to include the larger weapons, pelts, etc. 1. Unlike static objects, containers cannot have materials applied. Therefore the snow crate variations are no longer snow covered. Since materials cannot be applied to containers, textures would have to be created for the snow crate variations. If someone would like to make textures for me let me know. Textures are not my thing. 2. There are a couple of crate forms that are actually open crates that have been changed to containers. I will be fixing that in the next update. 2. If any mods that modify the original references such as changing position will not be compatible without a patch. 3. This mod does not modify leveled list, it only add new ones so the impact with other mods should be minimal. 4. I added a patch for JK's Skyrim by jkrojmal in the optional files section. Just the base vanilla esm files. USSEP is recommended but technically not required. This mod forwards USSEP changes, so for maximum compatibility its highly recommended. Install with NMM, Vortex, or MO2, or manually add the esp file. For load order, I recommend that this mod be installed before any mod that alters world spaces or cells objects. Simply remove the esp. There are no scripts. However, its always best to leave it installed.